As a batsman, this is where the hard work is put in. 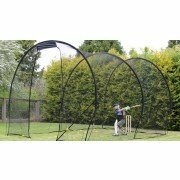 Cricket Training Nets allow batsmen to strike thousands of balls, repeatedly, helping them groove their shots. Practice makes perfect and the cricket training nets at All Rounder Cricket are a great practice tool allowing you to perfect your strokes.